Instrumentation Laboratory’s easy-to-use whole blood gas testing technology lets you perform time-sensitive diagnostic tests efficiently and accurately, in the central laboratory or at the point of care. Self-contained, multi-use testing cartridges and IQM, IL’s proprietary Intelligent Quality Management system, automates quality control to assure reliable results with no maintenance. Used worldwide in operating rooms, intensive care units and busy labs, IL’s systems set the standard for testing flexibility and convenience. The GEM® Instrument Family measures pH, blood gases, co-Oximetry, electrolytes, metabolites and more, and can provide a comprehensive analysis on a single sample of whole blood. We can put together a complete, integrated solution for one hospital or for a network of providers. With these whole blood immediate-care diagnostic systems, you and your patients get the results you need, when and where you need them most. 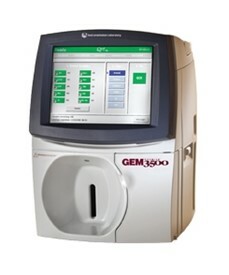 GEM Premier 3000: It simplifies every aspect of whole blood testing while delivering fast, reliable results in the lab or at the point-of-care. Disposable multi-use cartridge contains everything you need: sensors, solutions, waste bag, tubing, even the sampler. Maintenance free, just replace the cartridge every three weeks. iQM®, IL’s proprietary Intelligent Quality Management system, performs continuous quality control. GEMweb® software provides access to any networked analyzer to view results, monitor performance and deploy standard configurations. Add the GEM OPL CO-Oximeter and the GEM PCL Plus Portable Coagulation Laboratory to create a comprehensive critical care testing portfolio. GEM Premier 3500: Building on the unprecedented testing simplicity, flexibility and reliability of the GEM Premier 3000, the GEM Premier 3500 offers new capabilities in an enhanced system, adaptable to the needs and volume of the hospital and lab. Simple, maintenance free, multi-use, disposable cartridge PAKs and intuitive touchscreen menus are easy to use. Flexible- customized cartridge configurations and a broad test menu, meet the needs of any location and any testing capacity, cost- effectively. iQM®, IL’s proprietary Intelligent Quality Management system provides continuous, real-time quality control for the most accurate results, every time. Total connectivity, the GEMweb software allows information management and real-time communication throughout the hospital. Add the GEM OPL CO-Oximeter and the GEM PCL Plus Portable Coagulation Laboratory to create a comprehensive critical care testing portfolio. 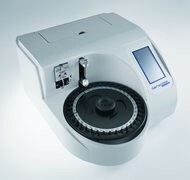 GEM Premier 4000: Unmatched quality assurance, total remote management and the most accurate results in a single touch. The GEM Premier 4000 now with PLUS Technology brings complete automation to the most labor and skill intensive tasks in critical care testing. At the touch of a button, the GEM Premier 4000 automates quality management through Intelligent Quality Management (iQM®), instrument maintenance with its multi-use disposable cartridge PAK and information management with GEMweb® Plus Custom Connectivity. Onboard CO-Oximetry and a full complement of parameters meet every testing need. Self-contained, multi-use cartridge PAKs include all testing components – just replace the cartridge every 30 days. PLUS Technology adds faster touchscreen response, integrated wireless communication and remote service features. Fully automated maintenance, quality control and information management help to ansure patient safety and enhance patient care. Measured Analytes: pH, pCO2, pO2, Na+, K+, Ca++, Glu, Lac, Hct, tHb, O2Hb, COHb, MetHb, HHb, Total Bilirubin. GEM OPL CO-Oximeter: Smarter, simpler, proven CO-Oximetry. The ideal solution for the laboratory or Point-of-Care Testing (POCT), adding comprehensive oxygenation status in a simple-to-use, compact critical care testing unit. With interface capabilities to the GEM Premier 3000 and other laboratory/hospital information systems, it increases connectivity throughout the hospital. Providing fast, reliable results on a small blood volume, IL’s highly portable GEM OPL is the ideal solution for CO-Oximetry testing, whenever it is needed. Parameters include: tHb, O2Hb, COHb, MetHb, sO2, O2Ct and O2Cap. GEM PCL Plus: The GEM PLC Plus is a portable, whole-blood coagulation system that provides rapid results for PT, APTT, ACT-LR, ACT and Citrate PT tests. With simple, easy-to-use features, it’s the ideal solution for laboratory and point-of-care testing. 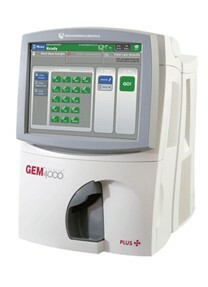 Add the GEM Premier 3500 analyzer and create a comprehensive critical care testing portfolio. iQM® Intelligent Quality Management: Helps ensure optimal test results for enhanced patient care. Instrumentation Laboratory’s patented quality assurance system helps ensure optimal test results for GEM Premier 3000, GEM Premier 3500 and GEM Premier 4000 systems regardless of time of day, location or operator proficiency. Providing continuous quality management with real-time error detection and correction, iQM® eliminates the need for traditional external quality controls and increases control in remote testing locations. IL’s iQM® is a breakthrough quality assurance software that continuously monitors critical care testing processes, assuring that quality standards are achieved 24 hours a day, 7 days a week. GEMdraw: Safer, more accurate arterial blood sampling. The GEM EasyDraw and GEM SafetyDraw aspirators and syringes, combined with the GEM Premier Family of analyzers, deliver a complete critical care testing system. Each device is designed to ensure optimal sample quality, maximum patient comfort and reduced operator risk. 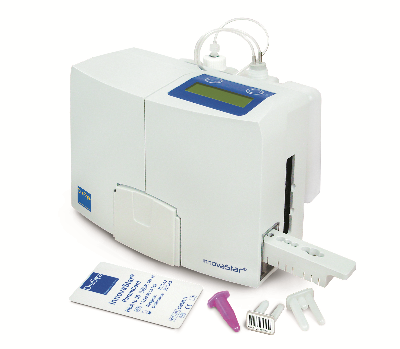 Part of the GEM Family, GEMdraw arterial blood samplers are designed to ensure analytical excellence from draw to analysis. Thromboelastometry is designed to assess clot formation and lysis by a reliable and fast method. The unique ball-bearing stabilized technology enables operation of the system in the busy situation of an operating theatre, even on a trolley. In addition to better patient care, ROTEM® guided therapy has been shown to effectively save cost. Early targeted treatment leads to better control of bleeding with lower transfusion requirements. Moreover, the reduced platelet transfusion has the additional potential of reducing ICU and hospital stay time. ROTEM® delta: Bleeding management for the patient’s benefit. In critical bleeding situations, coagulation testing in the laboratory is time consuming and may not correlate to the clinical picture. ROTEM® analysis is performed near the patient and provides information on hyperfibrinolysis, on the extend of dilutional coagulopathy, on the requirement for either fibrinogen or platelet substitution and on heparin and protamine dosage monitoring. 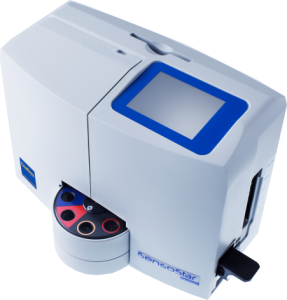 InnovaStar: POC convenience combined with laboratory precision. Measurement of HbA1c, CRP and glucose/hemoglobin from one sample only. HbA1c measurement is standardized according to IFCC reference method and DCCT/NGSP. Individual hematocrit correction for whole blood samples. Excellent comparability to clinical chemistry analyzers. Easy to use, rapid throughput. 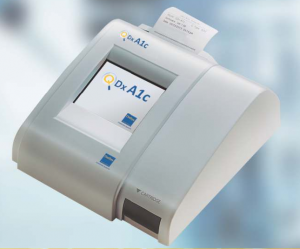 QDxA1c: Tabletop Point of Care HbA1c analyzer, designed to get your patients HbA1c results quickly and easily. Big on accuracy, small on space, compact & portable QDxA1c device gets integrated on physicians table with ease and delivers precision and accuracy comparable to HPLC systems. The system is temperature controlled for maximum precision and provides faster, economical testing compared to other methods. IFCC and NGSP certified. 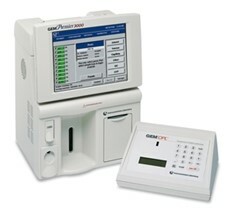 SensoStar GLHsix: Simultaneous measurement of glucose and/or lactate and/or hemoglobin. Biosensor technology: specific enzymatic reactions lead to high accuracy and excellent precision. Maintenance free biosensor. Individual hematocrit correction for whole blood samples. SensoStar GL30 touch: Biosensor technology for glucose and lactate measurement. High specificity and accuracy. Excellent precision, automatic calibration, high throughput. Maintenace free biosensor, individual hematocrit correction for whole blood samples. LABGEO IB10: The Samsung LABGEO IB10 is a portable, reliable and easy-to-use immunoassay analyzer for in-vitro determinations and provides medical professionals with rapid and accurate test results in emergency care settings where near patient testing is critical. Method comparisons show high correlation with central laboratory systems. Available test menu: Troponin I, NT-proBNP, Troponin I/ NT-pro-BNP, Troponin I/ CK-MB/ Myoglobin, D-Dimer, Troponin I/ NT-proBNP/ D-Dimer. LABGEO PT10: The Samsung LABGEO PT10 is a portable clinical chemistry analyzer that meets the needs of clinics while providing a smart solution to improve efficiency. 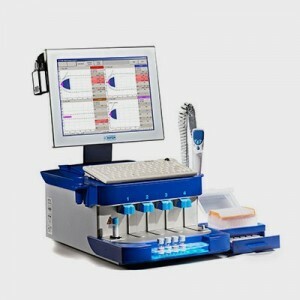 Rapid test results, simple & fully automated operation, multi-parameter testing. Optimized combination of up to 15 test parameters enables fast and accurate diagnosis. Test specific cartridges including liver function, renal function, lipid profile and overall biochemical profile allows multiple disease screening. 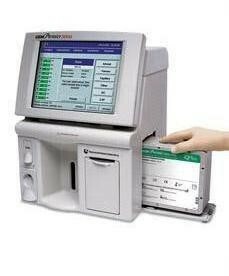 LABGEO HC10: The Samsung LABGEO HC10 is a 18 parameter 3-diff hematology analyzer. Rapid performance and high throughput, test to results within 45 seconds (80tests/hour). Auto sample loader which enhances workflow and reduces risk of infection. Advanced®BR2 Bilirubin Stat-Analyzer™: This system provides fast, accurate results for both total and direct bilirubin levels in neonates requiring only a 30μl serum or plasma sample. 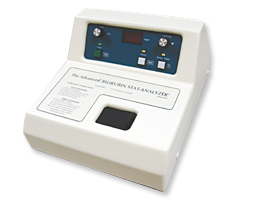 It determines total bilirubin by spectrophotometric analysis and direct bilirubin using a modified version of the proven Malloy-Evelyn method. Because of its compact, portable design and ease of use, it is ideally suited for pediatric physician offices, satellite labs, hospital stat labs, or pediatric research laboratories.